Concerta is a stimulant medication that can be addictive when abused. The risk of developing an addiction to Concerta is low when it is taken as prescribed. Many people who abuse Concerta also develop tolerance to the drug’s stimulant actions – soon needing to take increasingly higher doses to achieve the same effect as before. 7 This ever-spiraling drug use behavior can ultimately lead to addiction. Achieve a high similar to cocaine. Many people in their 20s can get their hands on ADHD stimulant medications even if they don’t have a prescription. Where do they get them? In 2016, Recovery Brands found that 63% of college-age people 18 to 28 years old get ADHD medications through their friends. 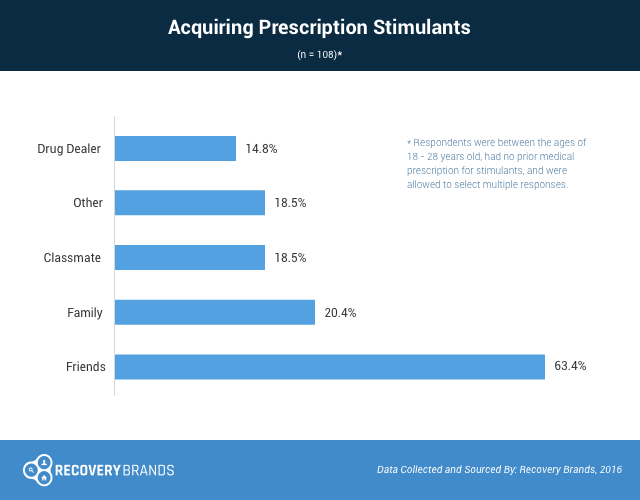 More than 20% acquire them from family, almost 20% from people they know from school, and almost 15% via a street dealer. Keeping track of prescription ADHD stimulants protects susceptible young men and women from the consequences of stimulant abuse. Some people who develop an addiction to Concerta might be slower to recognize the problem since the medication was prescribed to them by their doctor. Others may feel they are just using the drug to improve their performance and may fail to recognize that their use has become destructive. If you or someone you love is taking Concerta, it is important to be aware of the signs of addiction so that you can address the problem before it becomes severe. Severe depression and mental exhaustion after the drug wears off. Crushing and snorting the drug. Combining Concerta with other drugs and alcohol to intensify the effect. Tolerance to the effects of Concerta. Withdrawal from Concerta when it is not taken or taking Concerta to avoid withdrawal effects. Inability to quit or cut down use. Failure to meet personal and professional commitments due to Concerta abuse. Taking more Concerta than intended. Using Concerta in a physically harmful way. Spending an excessive amount of time on activities related to Concerta use. Continuing to use despite problems in relationships caused by Concerta use. Continuing to use Concerta even when it is causing or worsening physical and mental health problems. Giving up or missing out on important personal, recreational, social and professional activities because of Concerta use. If you or someone you love exhibits any of the above signs and symptoms, it is important to seek professional help as soon as possible. Who Answers? to learn more about what your insurance will cover. Whether you choose an inpatient or outpatient rehab facility: Inpatient treatment is generally more expensive and may not be fully covered under some health insurance plans. How long you stay: Some programs are 28 days long while others could be 6 months or longer. Where you stay: Every facility is different. Some treatment centers offer luxury amenities, private rooms and other special services that can increase the cost. Location of the facility: Cost of treatment varies from state to state and between urban and rural areas. Addiction treatment can be expensive. A month in a standard inpatient rehab facility with no added amenities costs an average of $10,000 to $20,000 per month. More private, executive or luxury rehab programs can cost upward of $80,000. For many people struggling with addiction, finances may seem like a significant barrier to treatment. People with a substance abuse problem may even forgo treatment because they think they can’t afford it. But don’t let the price prevent you from seeking professional help. You have several options for covering the cost. Personal savings: You might be hesitant about using your savings account to cover treatment. But investing in recovery may be the best way to spend this money. That’s because addiction can cost more than rehab in the long run due to health costs, financial problems and legal fees. If you think this may be an option for you, consider speaking with a financial advisor to help you with the decision. Payment plans and sliding scale rates: Many addiction treatment centers offer payment plans and sliding scale rates. Speak with the treatment center you are interested in attending to see what financing options they may have available. Credit cards: Paying for treatment with a credit card may be another option as it allows you to pay the treatment center in full and make payments to the credit card company over time. However, credit card interest rates can be high. Some healthcare financing credit cards are geared toward larger health-related expenditures and may offer lower interest rates and more flexible repayment plans. Loans: Some people choose to take out a bank loan to cover the cost of treatment. Seek a loan with a low interest rate and manageable payment terms. Borrowing: You can ask a family member or friend for a personal loan to help you cover treatment costs. Crowdfunding. Many popular crowdfunding websites such as GoFundMe allow you can seek financial assistance from friends, family and even strangers. You may be surprised how many people donate to your cause and how fast the funds add up. Sell assets: If you have valuable assets such as a car, boat, motorcycle, art work or jewelry, you might consider selling these items to help you fund treatment. This option can be difficult for people if they have a personal attachment to their belongings. But look at it as an investment in your future. After you complete treatment and regain control of your life, you can always purchase new things. Low-cost and free drug treatment: If none of the above methods of payment are possible for you, you can still seek free and low-cost drug treatment. Churches and nonprofit organizations offer free drug treatment services to those in need, but these programs can be hard to get into. If you do not have insurance and are concerned about covering the cost of treatment, call the Substance Abuse and Mental Health Services Administration’s (SAMHSA) 24/7 national helpline for assistance and information at 1-800-662-HELP (4357). Inpatient treatment: Takes place in a residential treatment center with around-the-clock care. You will typically stay in the center for at least 28 days. Other common inpatient programs last 60 days to 90 days or longer. Treatment usually consists of a combination of medically assisted detox, counseling, therapy, support groups, education and alternative therapies such as yoga, meditation and acupuncture. Outpatient treatment: May be a better option for some people. These programs often include the same treatment services as inpatient programs, but they take place part-time rather than full-time. Outpatient treatment allows you to remain active in your personal and professional life. It is also a more affordable option for those who have trouble covering the costs of inpatient programs. 12-step programs: Are step-by-step support groups that help people gradually work toward achieving and maintaining sobriety, often with the guidance of a sponsor. This process, along with the support of a group, can help people find purpose and build a solid foundation for a drug-free life. One 12-step program for addiction to Concerta and other prescription drugs is Pills Anonymous. Dual diagnosis: Many people who abuse Concerta were prescribed it for the treatment of ADHD. Dual diagnosis treatment addresses drug addiction as well as any other co-occurring mental disorders a person may have that contribute to his or her drug addiction. This may include depression, anxiety and bipolar disorder. Those who have ADHD may have to work with treatment staff to find other methods or medications to manage the disorder. Contingency management and cognitive behavioral therapy are two therapeutic approaches that may be helpful in overcoming a Concerta addiction. 6 Contingency management uses a reward system to reinforce drug-free behaviors such as negative urine tests. 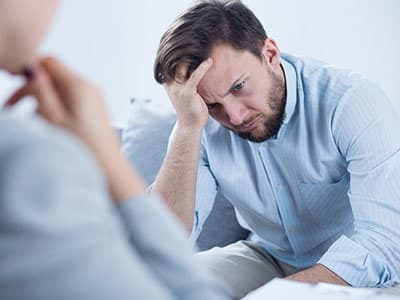 Cognitive behavioral therapy helps you identify and change maladaptive thoughts and behaviors that may be contributing to your substance abuse. Both treatment strategies may be used as part of either an inpatient or outpatient treatment program. Location: Do you want to attend a facility near your friends and family? Does your insurance cover treatment in this location? Cost: As discussed earlier, it is important to find a treatment program that is affordable for you. Qualifications of staff: Make sure the treatment center you choose has a well-rounded staff who can address addiction on all levels. 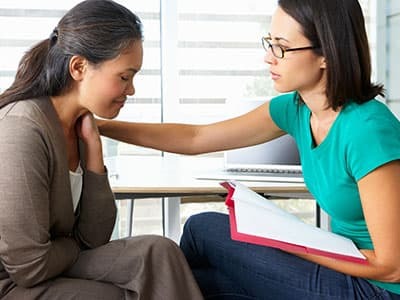 A treatment center should have a trained staff of licensed professionals including physicians, psychiatrists, psychologists, nurses and counselors. Program accreditation: Accreditation holds the facility to certain standards and to state licensing requirements. Finding an accredited facility provides added assurance that you will receive adequate care. Program philosophy: When choosing a treatment facility, try to find out the philosophy of the program and make sure it is aligned with your own personal philosophy, beliefs and values. If the center’s treatment philosophy doesn’t resonate with you, it could hinder your recovery process. Blood pressure and pulse changes. Sinusitis, irritation and bleeding of the nasal mucosa, perforated nasal septum (from snorting). Puncture marks and “tracks” (from injecting the drug). If you or someone you love is battling Concerta addiction, you don’t have to do it alone. Professional treatment can help you regain control of your life and maintain sobriety. For assistance finding a treatment center, contact one of our recovery support specialists at 1-888-319-2606 Who Answers? .
. McNeil Pediatrics. (2007). Concerta (Methylphenidate hydrochloride) tablet, extended release.
. Morton, W. & Stockton, G. (October 2000). Methylphenidate Abuse and Psychiatric Side Effects. The Primary Care Companion to the Journal of Clinical Psychiatry, 2(5): 159-164.
. Substance Abuse and Mental Health Services Administration (SAMHSA). (2015). Treatment for Substance Use Disorders.
. National Institute on Drug Abuse. (November 2014). Treating Addiction to Prescription Stimulants.
. Substance Abuse and Mental Health Services Administration (SAMHSA). (1999). Treatment for Stimulant Use Disorders.